MCHENRY – Members of St. Peter the Apostle in Oakland and Father Donald J. Parson’s previous parish assignments filled St. Peter at the Lake Center for the 74-year-old priest’s funeral Mass April 30. Archbishop William E. Lori officiated at the Mass. Concelebrating were priests with whom Father Parson had attended seminary. Among them was Father James D. Proffitt, a close friend ordained a year after Father Parson, in 1991. In the homily, Father Proffitt said that as family, friends and parishioners reminisced about the priest, one word surfaced repeatedly: curmudgeon. “I consulted various dictionaries, and they described ‘curmudgeon’ as a ‘bad-tempered or surly person, one easily annoyed or angered and often complains.’ Yup, that was Don,” said Father Proffitt as the congregation chuckled knowingly. Father Parson was straightforward, decisive and opinionated, said Father Proffitt, pastor of St. John the Evangelist, Severna Park. Father Parson was a “faithful servant leader” at St. Peter for 15 years who ministered with “wit, wisdom and dedication,” he said. Father Proffitt described the priest’s personality with short stories and adages, from being a “stickler” on matters ranging from proper liturgy to the crafting of an Old-Fashioned cocktail. He recalled Father Parson’s sense of humor, from which stemmed a nickname he used for Father Proffitt – “Radar,” from the TV show M*A*S*H.
Father Proffitt said one parishioner told him her pastor’s humor had compelled her to join the Catholic Church. “He was dedicated to empowering, and sometimes coercing, the lay faithful to step up and do their part,” he said. Father Proffitt’s description of the priest “nailed it,” said his brother, Robert Parson. Father Parson was found dead in his rectory kitchen April 25. He had suffered multiple health problems over the years, but his death was unexpected, family members said. What wasn’t a surprise was the priest’s decision to enter seminary in his 40s, said his sister, Nancy Holowecky. As a boy, he was active in the family’s parish in St. Mary’s, Pa., and had attended high school seminary at St. Vincent’s Academy in Latrobe, Pa., for one year. He served in the U.S. Navy during the Vietnam War and worked for a management consulting firm in Pittsburgh, Pa., while continuing to volunteer in his parish and the Knights of Columbus. Father Parson began studying to become a permanent deacon for the Archdiocese of Baltimore in 1981 and was ordained in 1984. He served at St. John the Evangelist in Columbia. A year later he entered St. Mary’s Seminary to study for the priesthood and was ordained a priest in 1990. For two years prior to his ordination he ministered as an intern at St. John the Evangelist, Severna Park. Father Parson served as associate pastor of St. Ursula, Parkville, 1990-95; Our Lady of Mount Carmel, Essex, 1995-96; and Church of the Resurrection, Ellicott City, 1996-98. In 1998 he was appointed administrator of St. Peter, and became its pastor in 2001. Parishioners from all parishes where he served attended the Mass, along with about 25 priests and deacons. In comments before the closing of the Mass, Archbishop Lori praised Father Parson’s work in ecumenical affairs and his affection for Oakland, the archdiocese’s westernmost parish. Father Parson’s legacy at the parish includes the $1.2 million Lake Center, which was blessed in 2009. He spearheaded the center’s construction 15 miles north of Oakland near McHenry to serve Deep Creek Lake’s summer vacationers. Not all parishioners were convinced of the need for the second church, but he forged ahead, confident in his pastoral duty, said lifelong St. Peter parishioner Jane Nolan. Betty Eaton, St. Peter’s religious education director, said that in Father Parson’s death she lost her boss, pastor and friend. She said he always encouraged her to try new ideas she had for faith formation programs. “He empowered me to be who I am,” she said. She described him as “bigger than life,” and not only because of his large stature. 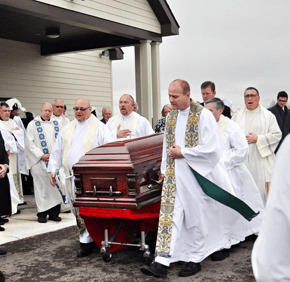 Father Parson was buried May 1 with military honors at St. Mary’s Catholic Cemetery in St. Mary’s, Pa.
Catholic Review assistant editor George P. Matysek Jr. contributed to this article.